We don't provide lunch or afternoon tea. It is best to have an early lunch before we pick you up and you can purchase snacks at the Margaret River Chocolate Factory or bring something with you for afternoon tea. We pick up from your city accommodation. Please bring a bottle of water and warm clothes for the evening, it can get quite cold in the Pinnacles Desert. I went with my two friends. We were a little group. only 11 people. The tour was lovely.We visited some shops in swan valley ( chocolate shop, caffee shop, honey shop), where you could taste their products. We used the surfboard on the desert at the end we went to pinnacles desert: we arrived before the sunset and the landscape was amazing! We had dinner together, like picnic under the stars, beatiful experience! I'd never seen in my life a sky full of stars. It was a lovely day with a fun company! 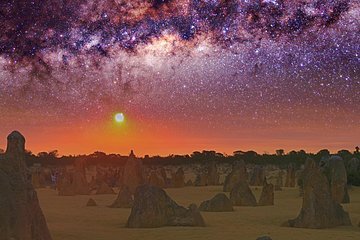 The Pinnacles at sunset are amazing. This tour was a great way to relax and enjoy the beautiful stars whilst having dinner and a glass of wine. Absolutely recommend it.